Drahthaar, or “metallic wire’s hair” (draht = wire, haar = hair); the name is a guarantee: last year the inscriptions to the L.O.I. increased of 28,8 % more than the previous year, and this was the only breed of group 7 to have a so evident growth. This is due to his qualities, found out by the hunters day after day. The Drahthaar has an erect carriage: the height at the withers is between 61 and 68 cm for the male and between 57 and 64 cm for the female; the colors can be brown roan, black roan with or without spots, brown with or without a spot on the chest; the covering hair is between 2 and 4 cm long with dense and waterproof undercoat; the vigorous look of the muzzle is underlined by marked eyebrows and a thick beard, that should not be very long, but quite hard. The Drahthaar, as the famous German shepherd dog and many other breeds, has been created by man. This means that the breed has been ideated and created with specific aims. The creation’s idea started in 1897 with the baron Sigismund von Zedlitz und Neukirk and with Herr Oberlander. In 1902 the first association was founded with the particular aim to improve the hunting style of these dogs, to let them get a strong and well-balanced structure and beauty. Who tried to breed this race received the following advice: “Breed as you wish, but be successful”. After various cross selections between Stickelhaar, Griffone, Pudelpointer, Kurzhaar and Pointer (the last two brought in their roan-black color), in 1906 the first standard draft was issued: “Pointer dog of medium size, noble looking, no striking color, very hard hair all over the body, intelligent look, vigorous, lively, faithful”. The results were astonishing: since 1923 the supremacy of this new breed started, even to the detriment of the cousin Kurzhaar. This supremacy still remains nowadays, but in spite of its success, this breed had to wait until 1928 to be recognized by the dogs lovers world. The baron Sigismund von Neukirk, well known with the pseudonym of Hegewald, the creator of the hard-haired German pointer, identified it with the sentence “Be rough outside, but tender in the heart”, and no other words could better describe our Drahthaar. He isn’t just a rough and strong tempered dog, he also loves endearments and can be mild, sweet and very generous. He’s conscious of his strength and I believe nothing can scare him. Drahthaar loves children and protects them from danger (my son is 5 years old and my Drahthaars adore him). He never attacks other dogs, but can defend himself very well; notwithstanding, he doesn’t have to be considered aggressive. Dr. Tiziano Rossi, vice-president of the Drahthaar Italian Club described the race as “a special generic, specialist in general”. This explains his versatility (he is very easy to be trained, and due to his smell, he’s also employed by the Civil Protection for the search of missing people in the rubble) in any kind of hunting, that becomes excellence in the case of the Queen of the Woods. I believe that the woodcock hunting is quite different from other ones, being more complicate and full of surprises, so that we need a very talented companion who’s so clever to be able to win in fantasy and sharpness the woodcock and all it would do to fly away. I’ve always found that my Drahthaars are such kind of dogs. Their greed allows them to operate in any kind of area, it doesn’t matter which difficulties they have to face, and even cold weather and bramble-bushes (acacias don’t bother them) do stimulate them to resist for hours. He doesn’t give up until he has some breath and some energy, and fortunately mother nature has been very generous with him in this sense. He’s not a trotter, but a good walker, and very rarely does he gallop away. He’s a straight pointer, sometimes he stops abruptly, as he feels the prey, keeps it firmly and would not leave it spontaneously. He’s resolute but careful, and would not force the prey to fly away. He’s respectful to the possible partner in the hunting, and as almost all continental dogs, is calm and would hardly give up to excitement in the action. He’s very suitable to any kind of ground: in a wood or in the bushes his search will narrow automatically (this is very important to keep in touch with the hunter, who might find less preys, but can better show his skills in shooting), to enlarge his range in open spaces, where he can better use his cleverness and show his sense of wild, proving himself as a very reliable companion. Drahthaar is very sharp and safe in bringing back the prey, not allowing even the most clever one to mock him. 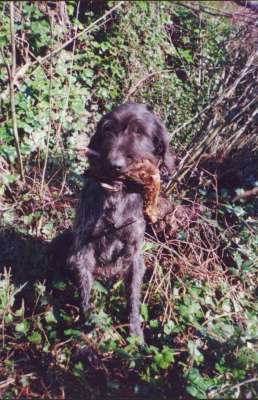 I’m so fond of this kind of dogs, that I am breeding them, and I have been employing them in the woodcock hunting since my first license, in 1983. In these 16 years my dogs and I have been hunting in the whereabouts of Genoa with all kind of weather from October to January. These dogs, not just mine, are not afraid of rain, fog, ice and damp, long marches nor brambles, and I do believe they have inside the very same holy fire that we have, that madness that will push you behind a woodcock even for the whole day and that will drive you crazy if you’d miss it, or will make you happy if you get it, and, finally, you’ll embrace your bushy companion, grateful for his great cooperation while caressing the feathers of the so desired Queen. There are many races, and all of them can enumerate good companions. Even if no one can satisfy all the different needs of the hunters, I believe Drahthaars can for most of them, as they did with me; however, you must remember that a good woodcock hunter has to be trained, you cannot just buy it.